Custom bookmarks are 100% made in USA. This includes all materials, printing, design and manufacturing. Custom Rectangle Paperweights, Dome Paperweights and Deluxe Dome Paperweights are 100% made in USA. This includes all materials, printing, design and manufacturing. Custom refrigerator magnets are 100% made in USA. This includes all materials, printing, design and manufacturing. Our custom laminated ornaments are 100% made in USA. This includes all materials, printing, design and manufacturing. Custom coffee mugs are available in two styles. Our "Made in USA" custom coffee mugs are 100% American made. This includes all materials, printing, design and manufacturing. Custom jigsaw puzzles and custom boxes are 100% made in USA. This includes all materials, printing, design and manufacturing. Custom luggage tags are 100% made in USA. This includes all materials, printing, design and manufacturing. Stamp pins are 100% made in USA. This includes all materials, printing, design and manufacturing. Actual U.S. postage stamps are used for this product. 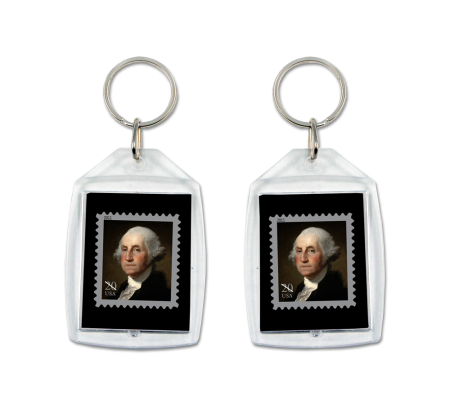 Our custom keychains are 100% made in USA. This includes all materials, printing, design and manufacturing. Stamps on Presentation Cards are 100% made in USA. This includes all materials, printing, design and manufacturing. Actual U.S. postage stamps are used for this product. Custom postcards are made in the USA. This includes all materials, printing and manufacturing. Custom plastic rulers are 100% made in USA. This includes all materials, printing, design and manufacturing. Rectangle, Dome, and Deluxe Dome Paperweight kits are made in USA. This includes all materials and manufacturing. All kit materials including mounting board, backing, gift box and velour bag are made in USA. Presidents Rulers are 100% made in USA. This includes all materials, printing, design and manufacturing. Our charms are manufactured in USA. Presidents Bookmarks are 100% made in USA. This includes all materials, printing, design and manufacturing. Mouse Pads are designed and printed in USA. T-shirts are designed and printed in USA. Custom ceramic ornaments are designed and printed in the USA. Custom tote bags designed and printed in the USA.